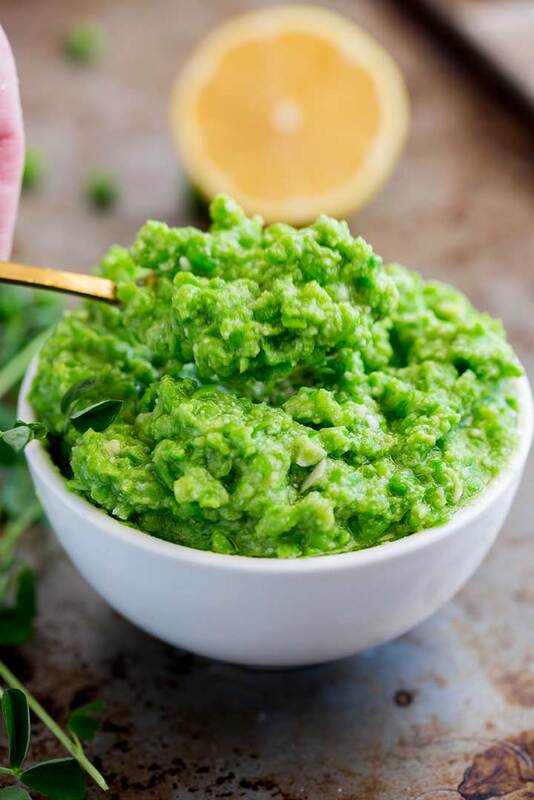 This Healthy Pea Pesto recipe is a twist on a classic; peas replace the traditional basil giving this pesto a wonderful fresh spring flavor. There are no nuts in this pesto, plus it is ready in under five minutes! So easy, fresh and creamy yet healthy, this pesto sauce is perfect for topping pasta, chicken, or serving as a dip or topping for Crostini or Bruschetta. 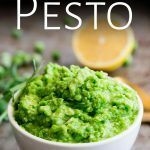 This pea pesto is so versatile! I have used it as a great sauce for chicken, fish, and lamb. A sauce that includes one of your vegetables, that is an all in one side dish – making it perfect for busy weeknights. 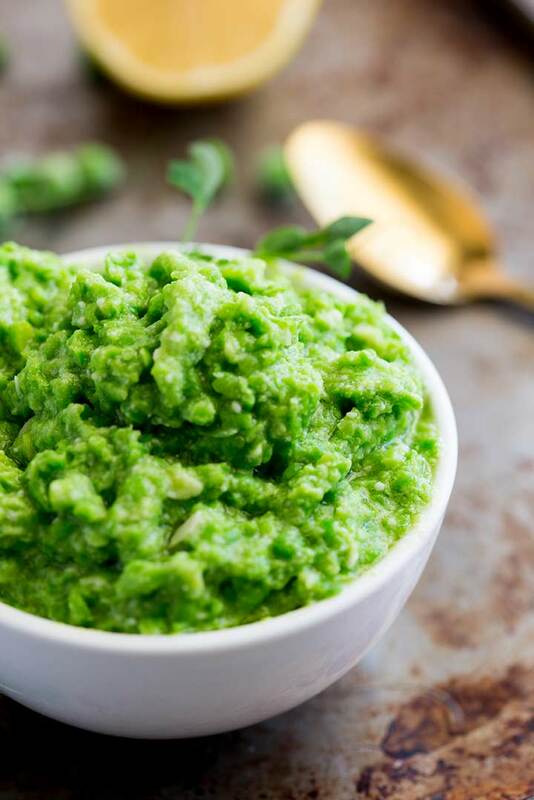 Plus you can make this with frozen peas, so you are only every five minutes away from this delicious pea pesto. Everything gets put into the food processor and pulse chopped until you have your desired consistency. For pasta, dips and crostini/bruschetta we like to keep this quite chunky, but when using it as a sauce I tend to give it an extra 30 seconds so it gets a little smoother. 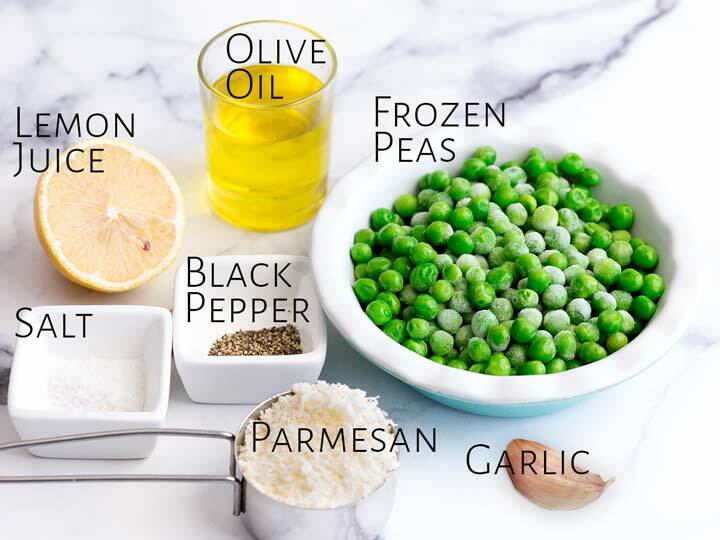 Can you use frozen peas to make pesto? YES!!! In fact I always make this with frozen peas! They are usually so much fresher than the fresh peas! If you are using frozen peas you can either plan ahead and get them out for 15 minutes so they are defrosted. Or place them in a pan of boiling water, bring back to the boil and then drain. You don’t need to cook them, just defrost them. 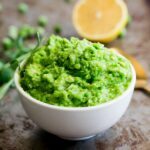 Can you freeze Pea Pesto? Yes, you can. This pea pesto freezes really well. Place it in a sealable container or ziplock bag and freeze it for up to 6 months. Defrost in the refrigerator and stir through pasta for a quick dinner, or serve it with crostini for an impromptu party. Pin this recipe for Pea Pesto. 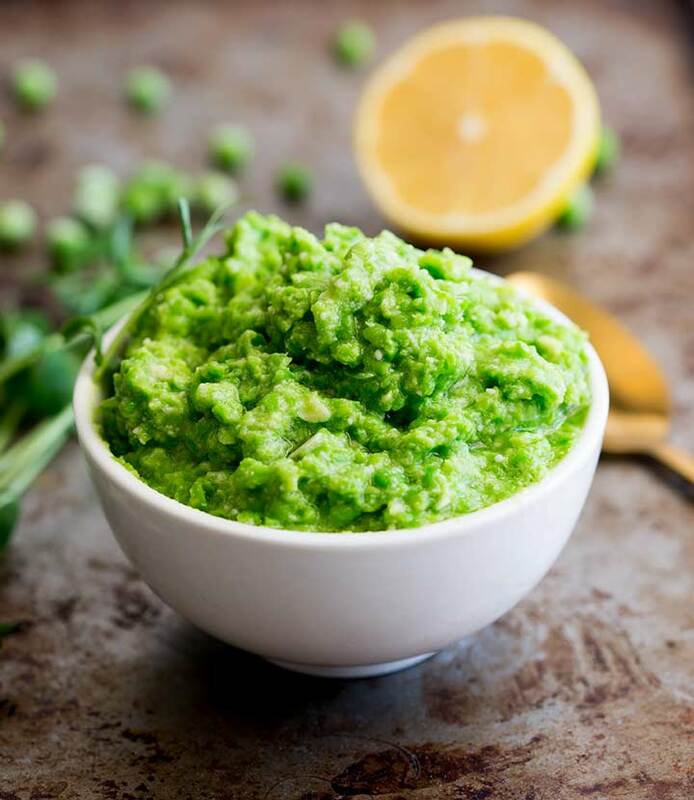 This Healthy Pea Pesto recipe is a twist on a classic; peas replace the traditional basil giving this pesto a wonderful fresh spring flavor. There are no nuts in this pesto, plus it is ready in under five minutes! So easy, fresh and creamy yet healthy, this pesto sauce is perfect for topping pasta, chicken, or serving as a dip or topping for Crostini or Bruschetta. Place the ingredients in a food processor and use the pulse button to chop and combine them until you reach your desired consistency. Use immediately as a sauce for pasta/chicken/fish, as a dip or as a topping for crostini/bruschetta. Or the pea pesto can be frozen in an airtight container for up to 6 months.